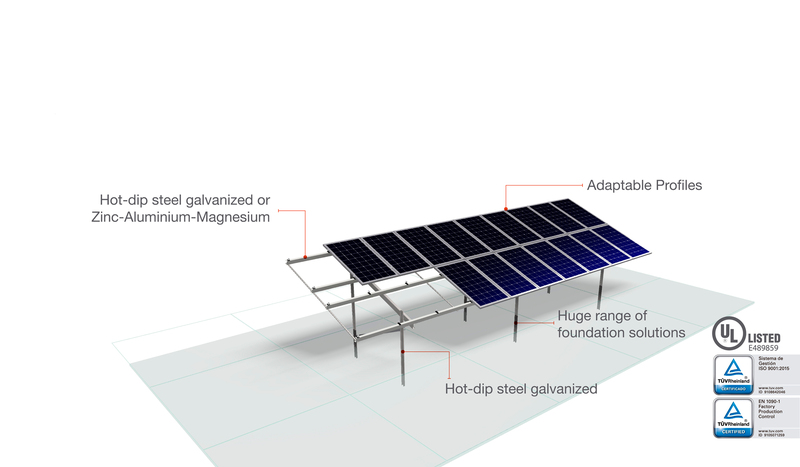 Solar ground mounting systems, designed and manufactured by Axial, adapt to the specific conditions of each project (terrain, calculation standard, climate conditions, etc.) We control 100% of the production and traceability, which allows us to carry out a greater volume of projects without manufacturing time loss. We manufacture hot-dip galvanized steel structures and aluminum structures. The major steel bases are made of S235JR, S275JR and S355JR according to EN 10025-2:2004 Standard. Hot-dip galvanization follows rigorously UNE-EN/ISO 1461, UNE-EN/ISO 14713 and UNE-EN1179 Standards. We design our ground structures to be prepared for different anchoring system, ramming, pre-drilled, on foundation, on foundation screw and ballasted.